The "Ernst - Hansen - School" is a multi cultural school! The "Ernst - Hansen - School" truly is a multi cultural school! In 2014 two schools joind and now it has about 180 students from grade 2 to grade 10. 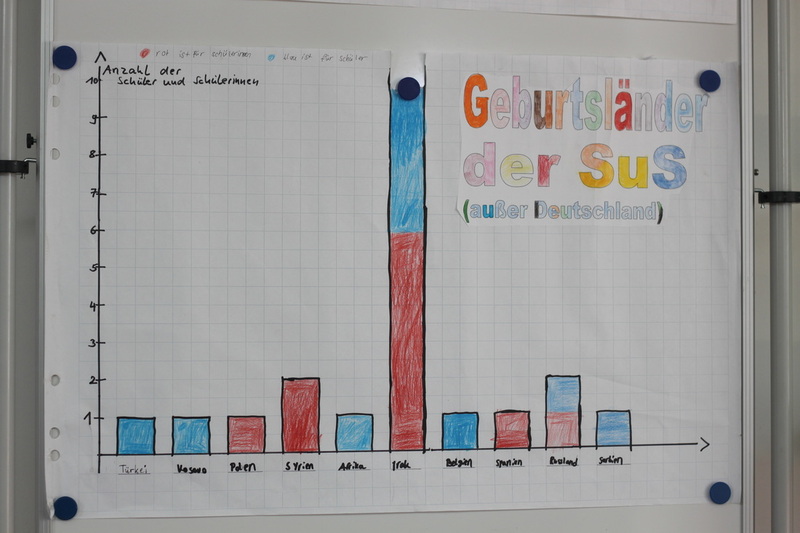 Class 6 created a poll about the students country of birth and home language. They also asked students about their parents country of birth. 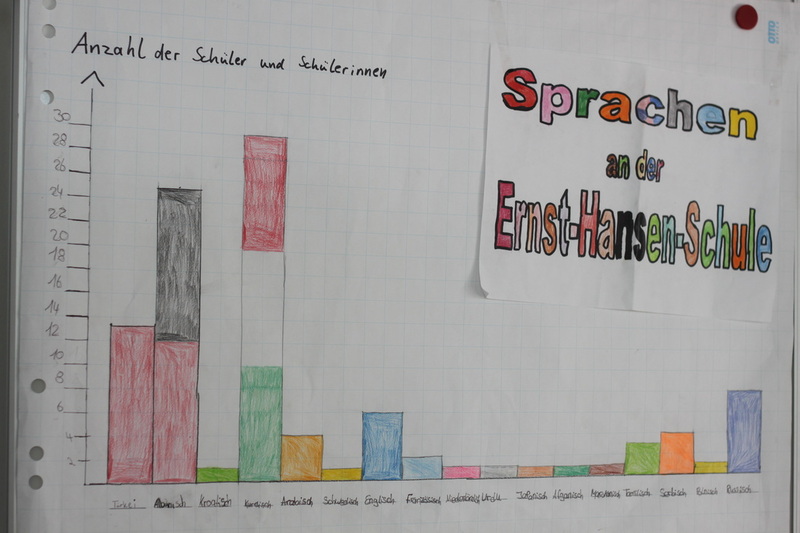 They then used the data to create statistical diagrams, as you can see in the pictures. We had lots of data to process. 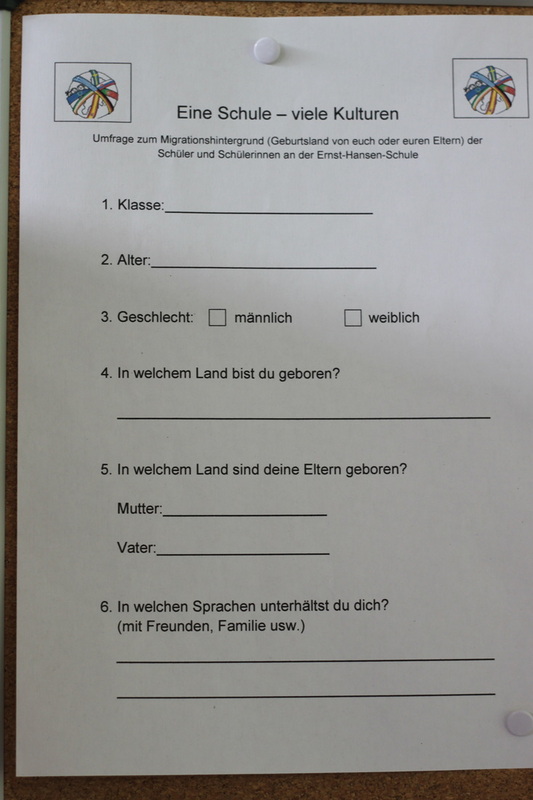 Here you see a copy of our questionair. 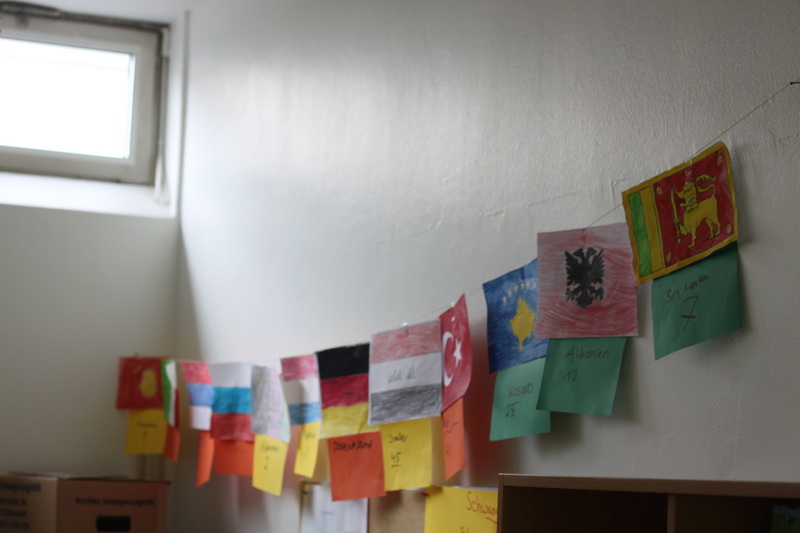 The parents of our students were born in over 25 different countries. For each birthcountry we painted the national flag. 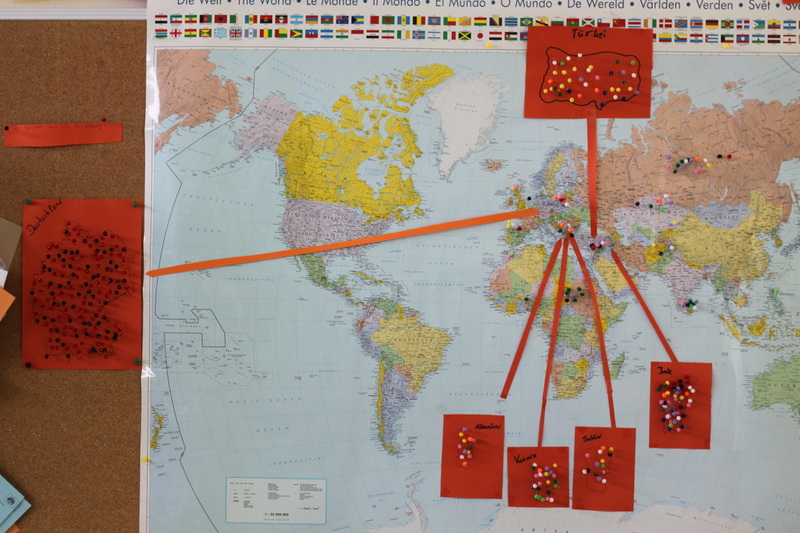 They are now displayed in our classroom.We also visualiesed this on a world map, as you can see in the picture below. 10 of our students were born in Iraq. 2 students were born in Syria and also 2 in Russia. 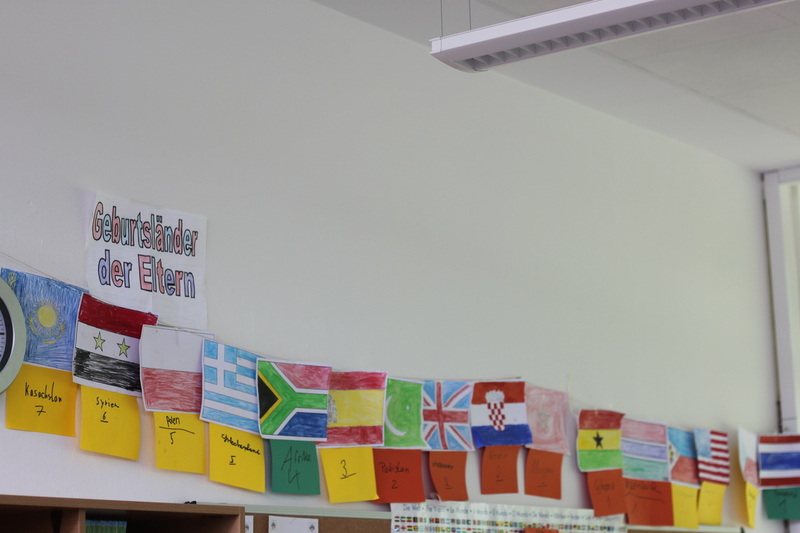 1 students was born in Turkey and also in Kossovo, Poland, Belgium, Spain, Africa and Serbia. 3.400 refugees arrived in Bielefeld in 2015, many more came to register and were send to other cities and counties. Bielefeld has about34 000 inhabitants and is not allowed to take more immigrants than that 10 %, so we are full! There are still refugees arriving in Bielefeld, but it is just for the registration before they are being sent to another city. Some of our student’s families hosted refugees in their own homes, since members of their own family members were among the refugees. In class we watched movies and looked at photos of the refugee’s situation in their home countries and their situation in our town. We discussed about war and other reasons for fleeing. We also planned on getting involved and helping. First we collected donations of clothes among families and teachers and brought it to the place of first accommodation/initiate on in Bielefeld. We also baked cakes and gave them to a Coffee Shop called „Cafe Welcome“ that spreads free coffee, tee, water and cake to migrants that have to wait for registration. The waiting time was tremendous, especially in November, it took days. 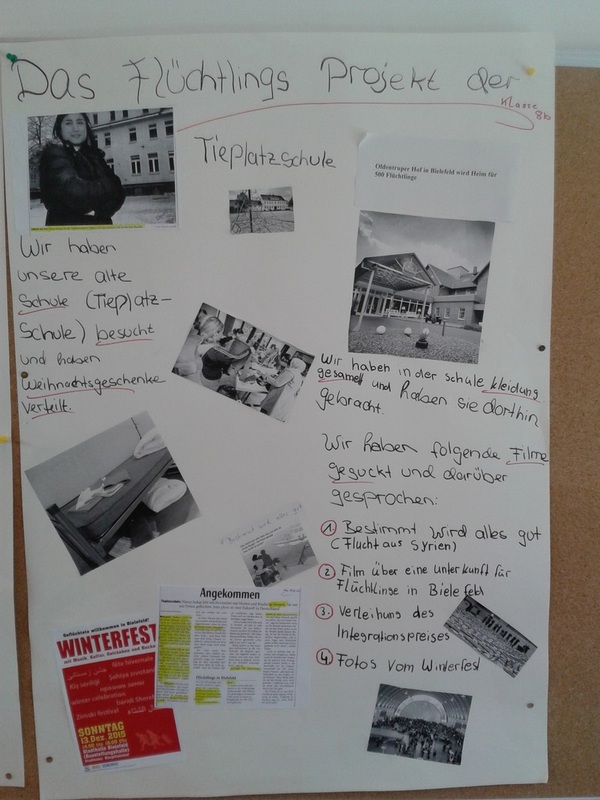 The year 8 of our school works for the so called „students firm – kiosk & Coffee Shop“. Within that firm we started different fund raising campaigns by making and selling Hotdogs and Cup Cakes as well as just collecting money from students and school staff with a charity tin. We used the money to buy socks for children, games, balls, crayons and sweets for children who live in the schools former building (Maybe you remember, that our school had to move two years ago. That building is now used for homes for refugees). Some kids of our school went to play with the refugees living there. Some were very kind end very eager to learn German from us.